Knitting a star may seem like a rather intimidating project, but it’s not really that difficult once you see how it’s done. And the results are really cute to use for ornaments on the tree, to decorate gift bags or however else you would like. 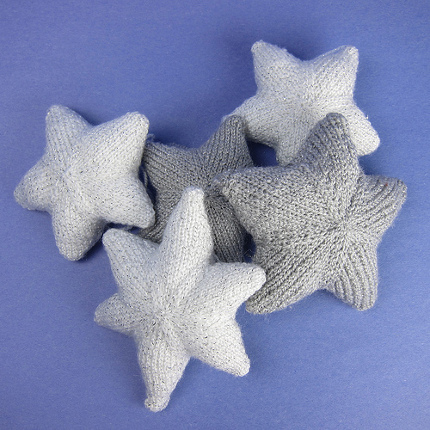 Kat at Just Crafty Enough developed an easy knit star pattern that you can alter to make a five- or six-point star. The six-point stars are a little elongated but still quite pretty and would be perfect for Hanukkah decorations as well. She works each point and then joins them together. Don’t worry, there are plenty of pictures to get you through your first one. Wouldn’t a garland of these just be adorable on the mantel?